Accessory Handset Only Requires a CLP99183, CL999283, CLP99383, CLP99353, CLP99483, CLP99453, CLP99583, CLP99553 to operate Mobile Notifications Know when your Android mobile phone receives a text, e-mail or social media update. Each handset beeps and displays which kind of message was received. You can also receive calendar reminders through the system. Caller ID Announce Screening calls has never been easier. The handset announces the name of the caller, so you don't have to scramble for the handset to see who's calling. Features Caller ID announce Push-to-Talk HD audio with equalizer for customized audio Simulated full-duplex handset speakerphone Big buttons Caller ID/call waiting 50 name and number caller ID history ECO mode power-conserving technology Quiet mode DECT 6.0 digital technology Intercom between handsets Conference between an outside line and up to 4 cordless handsets 200 name and number phonebook directory Voicemail waiting indicator Quick access key for voicemail box Last 10 number redial English/Spanish/French setup menu Mute Any key answer Connect To Cell Features Make and receive calls from your cellular plan while enjoying the comforts of a home phone system. By connecting to your mobile phone with Bluetooth technology, this feature allows you to manage calls using either your cell or home phone, and offers expansion flexibility. 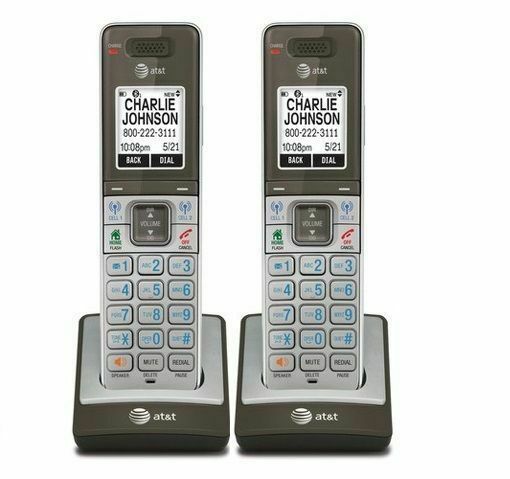 Download up to 6,000 cellular phonebook entries to the cordless handsets. Pair up to two cellular lines and one landline with your cordless system. Then, enjoy the freedom to make and receive calls on all three lines-all at once. Downloadable phonebook directory Mobile notifications Virtual multi-line operation Ringtone share - set your cordless phone to play your iPhone (iOS4. Awesome, very easy to add to existing system. Full of features! Great phone system. I love the caller ID announcement as well as connecting to my cell phone. I can simply pick up one of the handset to answer my cell when it is in another room. all- in- one. great price, good sound, many features. highly recommend!